Our private rides will travel along a five mile trail through the beautiful Peace county.We can handle one or two people in the sled plus the musher.Enjoy a warm cup of hot chocolate and snacks after your ride. Photo tours will travel along known wildlife trails .A bit slower with stops as needed for photography.Hot chocolate and snacks provided as well. Available Packages: We offer family packages,private rides,photo tours as well as group packages and gift certificates for something different ! We are very mobile as long as we have a safe trail we can attend your group functions or we can help host a group function.Rides are with one or two teams of Siberian Huskys as well as one or two mushers depending on the size of your group.Give us a call and we can make a variety of things work! UNDER 6 FREE WHEN ACCOMPANIED BY PAID ADULT. BIRTHDAY,CHRISTMAS AND SPECIAL OCCASION GIFT CERTIFICATES AVAILABLE.Call for quote. note:Non refundable deposits are required for bookings.Tours will not run below minus 25 or if trail becomes unsafe for dogs you will be rebooked.No alcohol please. Rates and times subject to change please contact for info. 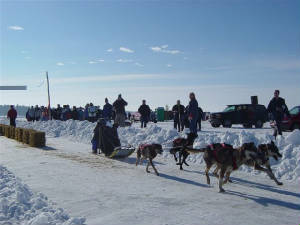 NOTE: INSURANCE WAIVER WILL BE PROVIDED AND MUST BE COMPLETED BY EVERY ONE PRIOR COMMENCEMENT OF ANY ACTIVITIES WITH OR RELATED TO SOUTH POINT SLED DOG TOURS, MUSHERS / HANDLERS OR DOGS.NO EXCEPTIONS ! !